Swings serve as shelves in this Tokyo shop by Japanese designer Hiroaki Matsuyama of Minorpoet. 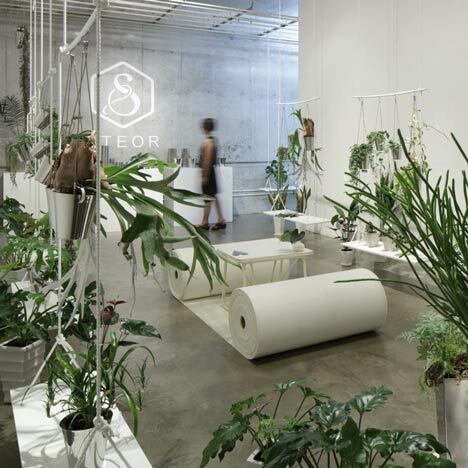 Minorpoet were commissioned to show off the new collection of planters and accessories by stainless-steel company Steor. Enormous rolls of material serve as seats either side of a small table in the middle of the concrete floor. Photographs are by Satoshi Shigeta/Nacasa & Partners. We created the setting for the exhibition 'STEOR Spring Collection 2011'. STEOR is the stainless steel product brand from Japan. All items are worked with Japanese artisans. On this collection, they produced various products for houseplants and flowers. We proposed the swings hanging from the ceiling as shelves. By this swings, a wide variety products and green are organised into a one space. This familiar form for all the ages goes well together with simple and playful products.